Practice Walk Three for the Financial Force Three Peaks Challenge was a 15 mile hike around the valleys of Wharfedale and Littondale. 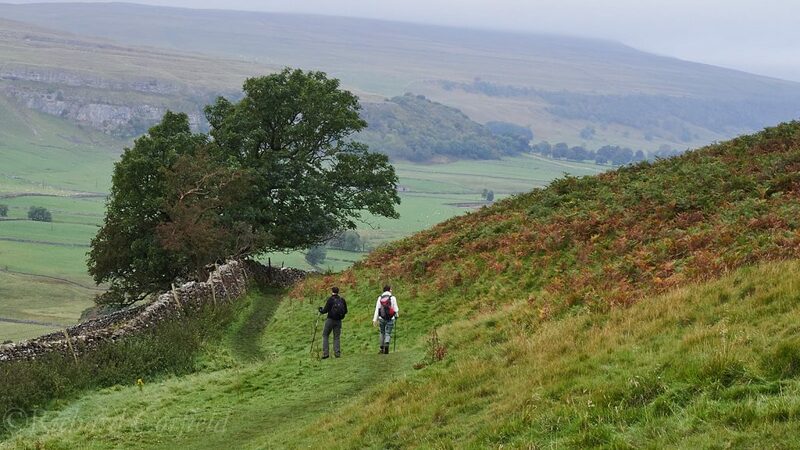 Three walkers started early, meeting at the office for 7:30, then driving out to Kettlewell to start walking at 9am. 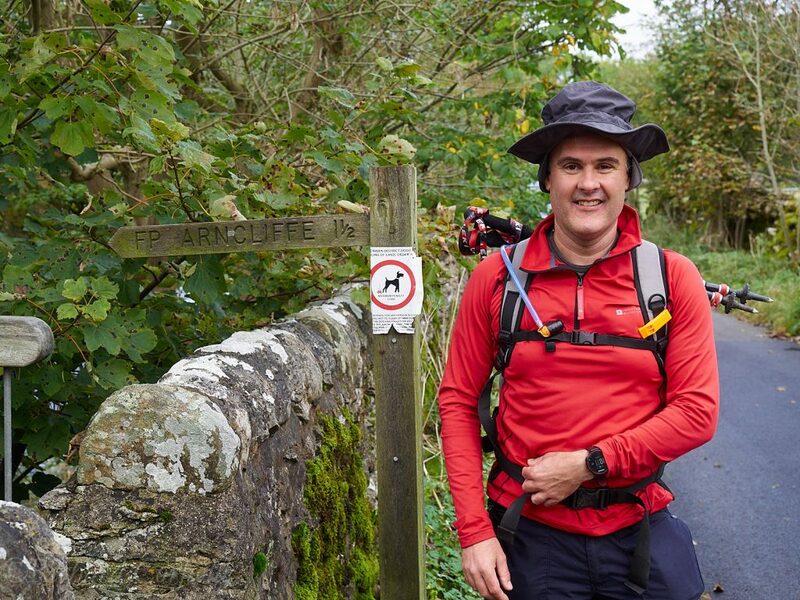 The route started with a small hill climb around the ridge towards Hawkswick. A new permissive footpath from the road corner at Kettlewell removed the stretch of walk along the edge of a busy road, keeping us safely away from cars. We said hello to a small group with huge rucksacks starting their Duke of Edinburgh challenge before leaving them behind. Then we rounded the corner of Knipe Scar before turning and descending into Littondale. The path turned to a track, which dropped down to Hawkswick. There we crossed the river on an old metal bridge and walked up the valley to Arncliffe. 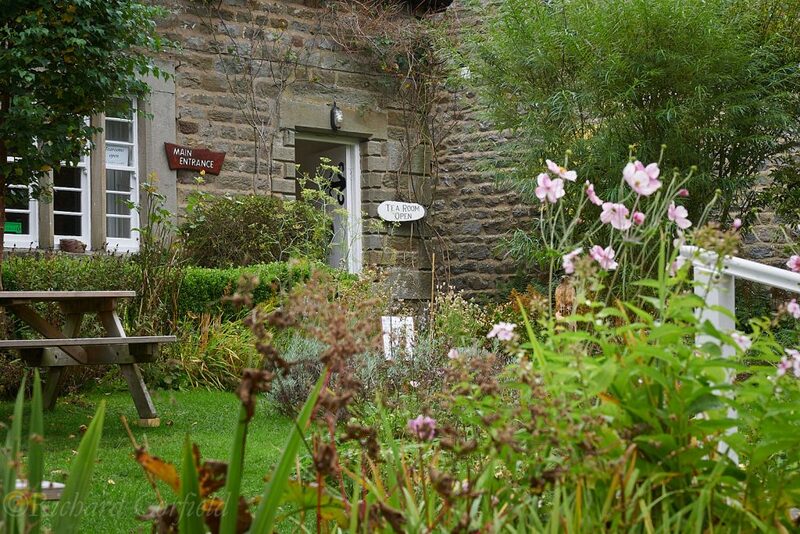 Arncliffe was a favourite place to visit for my family due to its excellent pub, The Falcon. It is a long time since I had chance to visit and see if it remains as good as it was. It was early morning, too early for the pub, so we followed the path around the village and onwards up the valley. Littondale was very quiet. Apart from the Duke of Edinburgh group near Kettlewell, we did not meet any other walkers until we arrived at Litton. The route plan was to use the stepping stones to cross the river Skirfare. We’d had a fair amount of rain, and with the fields quite wet we were worried that we’d not be able to cross. The backup plan was to continue up the West side of the river to use one of the footbridges at Litton. We found that the river was quite dry, completely dry a little upstream. The river must run underground here. We stopped to eat outside the Queen’s Arms at Litton and waited for the pub to open hoping for a beer, or more sensibly a coffee. The pub does not allow the consumption of own food outside, so we were moved on. We met one walker on the climb towards Haw Fell. He wished us good luck when we said we’d be crossing over to Buckden. We later found out why. The climb towards the triangulation point was steep. It is normal when walking in the Dales to see false peaks. A walker would walk to a ridge thinking it was the top, only to find another ridge and another climb behind it. It is possible with the large scale map to work out whether the ridge you are looking at is the real summit or not. Once the track we were following had turned left up the hill, the top was in sight. The path was paved towards the top with peat bog to the side. The trig point was not far from the path. Pen-y-Ghent was visible to the West, mostly covered in cloud. The paved surface continued for a short distance down the hill towards Buckden, then abruptly stopped between two marker posts. From then on down the hill we were walking through bog. We all managed to slip or sink our feet into it at some point. 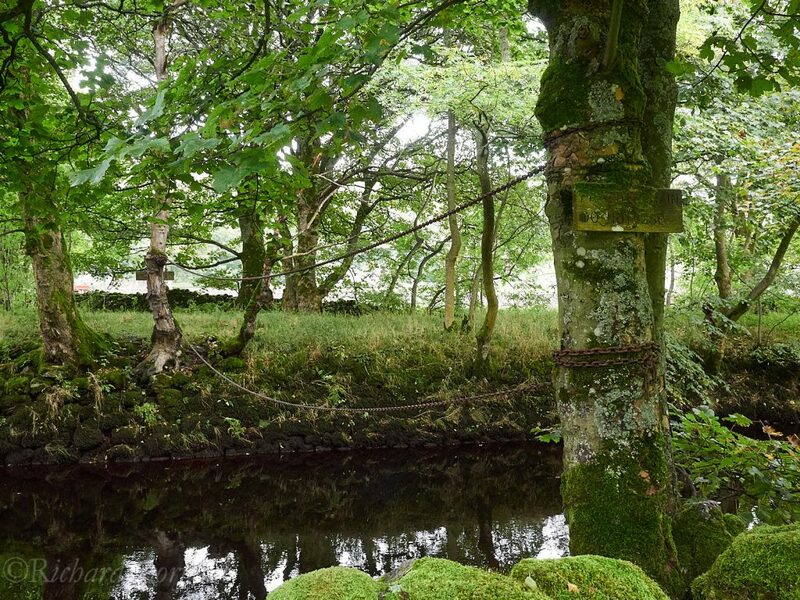 Navigation here was by compass bearing between short marker posts marked with the blue top for “Bridle Way”. The Spectra System compass I was using worked quite well, designed to give a stable reading on the move and proving easy to align in this case (bearing “Blue 3”). It gives a granularity of 15 degrees when used off the map, which is quite coarse. Sighting using it is like using a small baseplate compass. It can be used to orient the map when held against the map for an accurate indication of direction. This seems the designed method of use. A sighting compass or large baseplate compass may have made picking a distant spot to aim for easier. 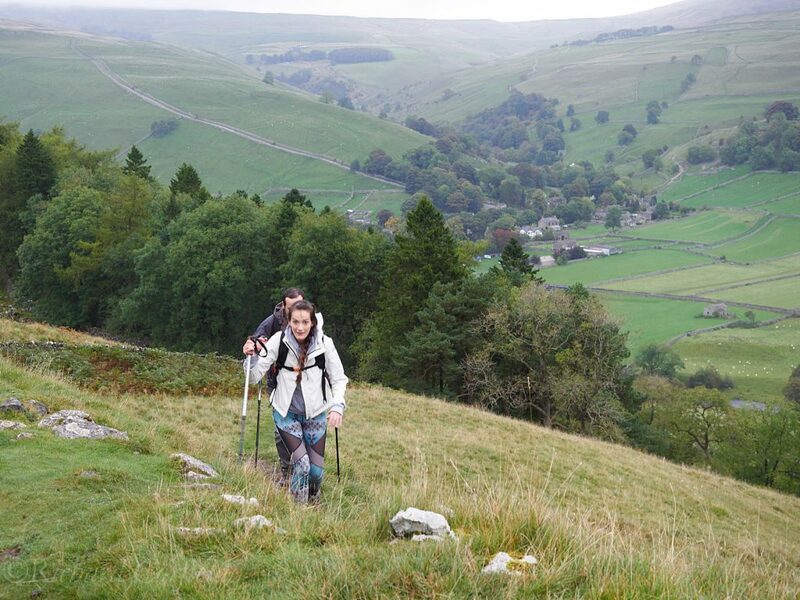 I will be sure to carry mine for the Three Peaks challenge, though the paths there are quite clear. In this case there were useful landmarks that could be found on the map and the path was visible once you knew where to look. We reached the farm track at the right point and followed it down the hill, through sheep pens, to the road. The rain started as we approached Buckden. It was a light drizzle at first. We diverted from the planned route into Buckden village where, behind the pub, we found a small tea room. Here we sat out the rain drinking coffee and tea and eating scones with jam and cream. The tea shop could be described as a “Proper Tea Shop”. There were a lot of very interesting cakes on the menu, as well as pies which sounded very tempting. Our route back to Kettlewell took us along the Dales Way. There must have been a running event because the route was very clearly marked with red and white tape. A route option which we didn’t take would have been to climb the ridge to the East and drop down on Kettlewell from above. Instead we chose to follow the river. We met a group of families who were visiting Kettlewell for the weekend, and who’s children were swimming in the river which must have been cold! We passed a crossing point made up of two chains hung between trees. This was not our planned route, but is marked as a public right of way on the map. It’s a good job we hadn’t planned to use it. The sign on our side of the crossing was old and not possible to read. We could read enough to know that it was a warning not to use the crossing. It could have been fun to try! We reached Kettlewell at about 5pm, after 8 hours of walking. If this was the Three Peaks then we’d still have another mountain to climb, which I think will be hard. My learning point from the walk is that it’s really important what is inside your boots. This time I ignored the modern wisdom that a single pair of socks is best and had comfortable feet inside thin liner socks and thick walking socks. 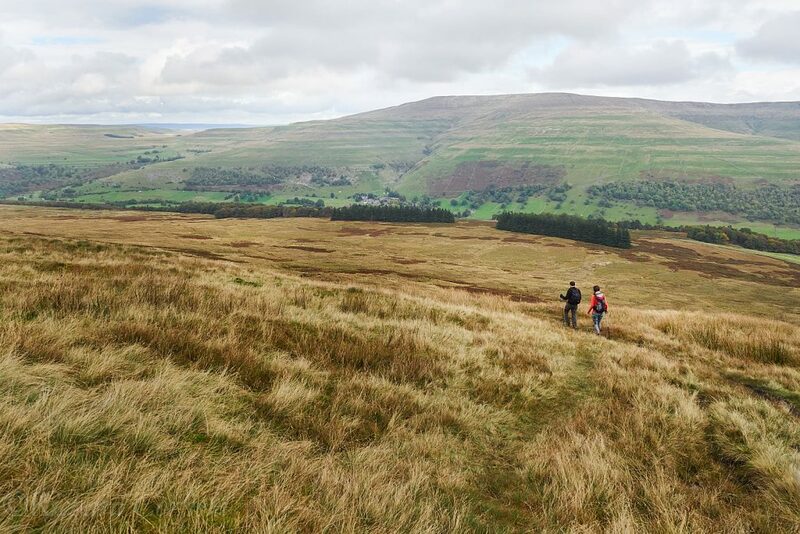 This walk was chosen to be over half the distance of the Three Peaks challenge and about half the height. 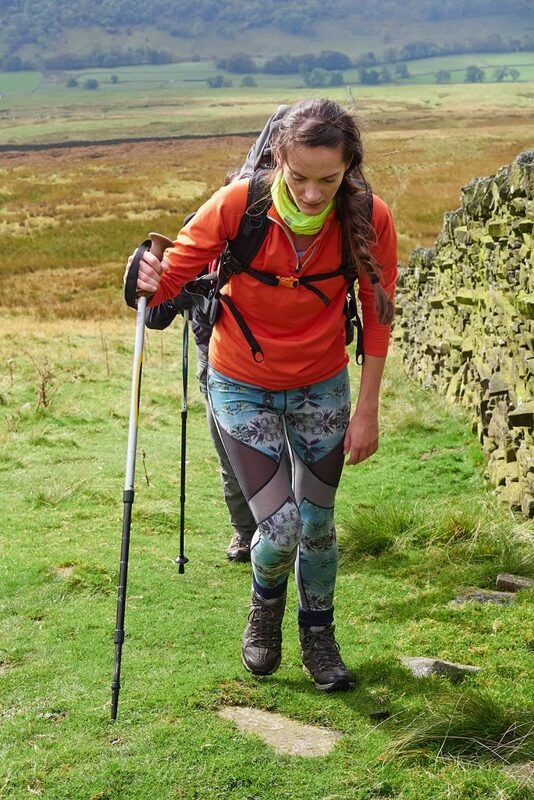 If somebody can complete this walk comfortably then this is a good sign for the Three Peaks.